James Khodabakhsh, MD, is well known as the leading refractive, cataract, and glaucoma surgeon in Beverly Hills and Torrance, California. As a board-certified ophthalmologist at Beverly Hills Institute of Ophthalmology, he offers specialized care including LASIK surgery, cataract surgery, cornea transplant surgery, glaucoma treatment, and other advanced eye care to teen and adult patients. Dr. Khodabakhsh completed his medical degree at New York Medical College in Valhalla, New York. He then joined the New York Medical College faculty as a clinical assistant professor of ophthalmology. The work of Dr. Khodabakhsh appears in a number of leading ophthalmic publications including The American Journal of Ophthalmology. He’s also highly regarded as a national and international lecturer on anterior segment eye disease and refractive surgery. 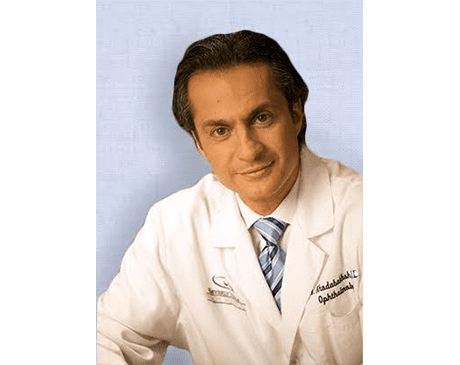 For patient convenience, Dr. Khodabakhsh maintains surgical credentials at Specialty Surgical Center, Cedars Sinai Medical Center, UCLA, Torrance Memorial Hospital, and Surgery Center of the South Bay. Dr. Khodabakhsh is the Department Chief of Ophthalmology at Cedar’s Sinai overseeing over 100 ophthalmologists. He is a pioneer in the field of Premium Cataract Surgery. He was among the first to use newer technologies and also functions as a consultant. Dr. Khodabaksh is currently welcoming new patients at Beverly Hills Institute of Ophthalmology. Use the online scheduler or call to book an appointment today.